“I’ve said a quick prayer, committed myself to this effort and reaching out to you with a heavy heart and with shame. I hope to be able to come across to you in this email for help. My 19-year old Cocker Spaniel, Silas, died on 4/5/16 and I brought another dog into my life too soon. She is such a beauty; she can sit, stay, offers her paw, takes treats ever so gently, kisses galore for no reason at all, loves to just hang out on the sofa to relax and sleeps soundly all through the night right be side me. I have nothing but goodness to share about her. She is 4-5 and weighs 40#. She has been given an excellent bill of health by my veterinarian. The reason I’m reaching out for assistance is her energy, far more than I can match or care for at this time in my life, it is so unfortunate and I’m ashamed that I didn’t consider she would need alot of exercise. I’ve read almost every word on your website and I’m convinced that I’ve been divinely led to your care… and pondered the decision that I’m making today, that is to re-home her where she will have more socialization with more people (I’m single and live alone, no children and no other dogs) and where she will get to play with other dogs that she seems to love from the few outings we’ve shared. If you’d like to be considered for Daphne, please go here to learn all about Our Adoption Process. We don’t use a traditional application, but we would like you to answer a few questions so we can get to know you better. Check out her Photos on Facebook! 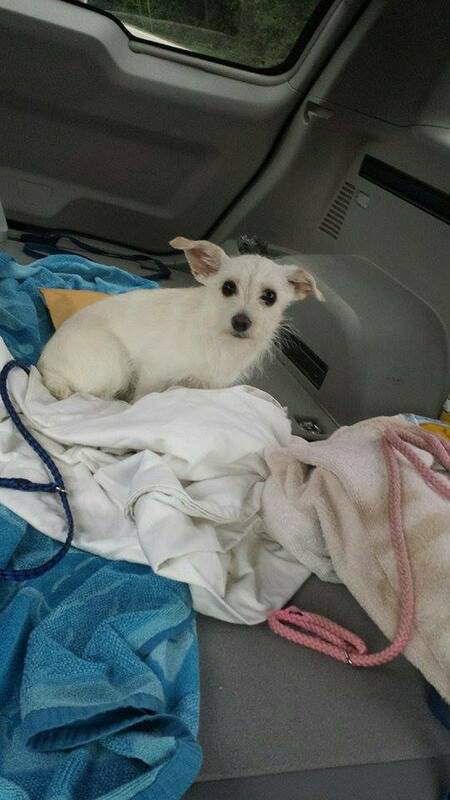 7/8/16 Update: Daphne has found her home! 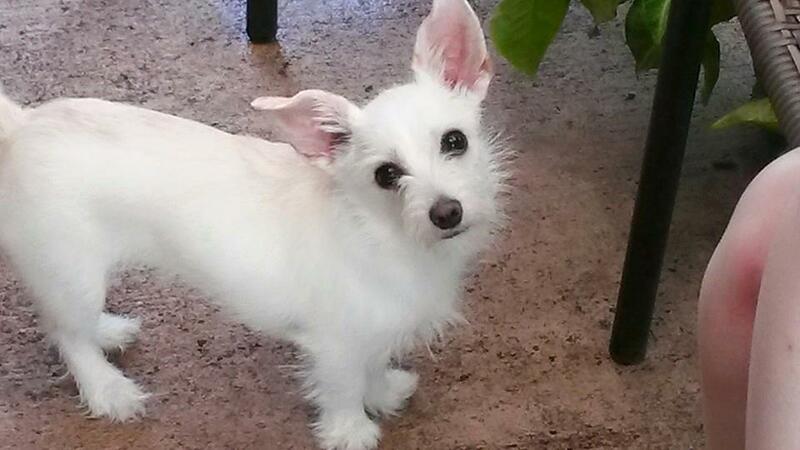 She has been adopted by Roland and Captain Teemo’s Family, The Johnsons! She and Teemo seem to be settling in well together! Congratulations to them all! 10/4/16 Update: Daphne is doing well! Here she is smiling in Tennessee! The Scruffy Puppies are on their way to Santa’s Workshop to become this year’s most loved Christmas Presents! I love the holidays. There is always something magical about this time of year, the promise of something unexpected. This year, that promise was fulfilled in a litter of scruffy puppies. 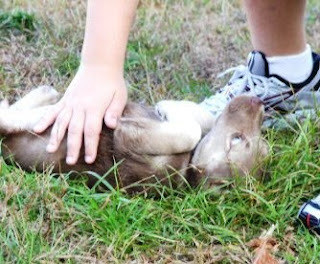 I had agreed to take in Jackson Brown and Sprint, two border collies in a shelter in Alabama. 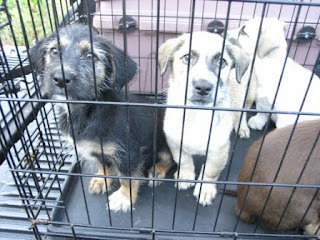 At the last minute, on 10/18/09 the shelter asked if I would also take a litter of puppies. If not, they would be euthanized since they were not weaned and they didn’t have the staff to bottle-feed them. Good grief, what would you say? Yeah, me too! Click here for the original story. 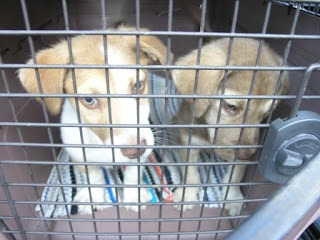 And so arrived on my doorstep the Scruffy puppies, as I came to call them. Soooo tiny, so fragile. We fed them mushy puppy food with formula, we gave them meds, we dewormed them, we loved them, we did all we knew how, but sadly two of them didn’t make it. But those that did? Oh my, they’re beautiful! Four girls, two boys. Breed? I don’t know. There was obviously more than one father involved ~ did you know that littermates can have different dads? But if I had to guess… hmmm. Most of them look like they have a touch of basset in them ~ longer bodies and ears, turne out front legs. I see Australian Shepherd in some of those faces too. A couple look like maybe a bit of Springer Spaniel. And one I really do believe is part Schnauzer! Whoever adopts these puppies has to promise me that they’ll send pictures when they grow up so I can see what I had. With permission I’ll pass them on to the families of the other littermates. So these are the Christmas suprise puppies. I didn’t expect them and yet they are more beautiful than I could have hoped. 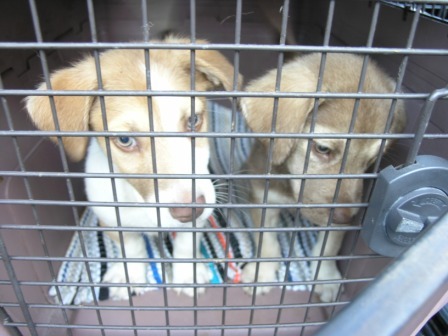 They are little survivors who are ready to take life by the tail and run with it! 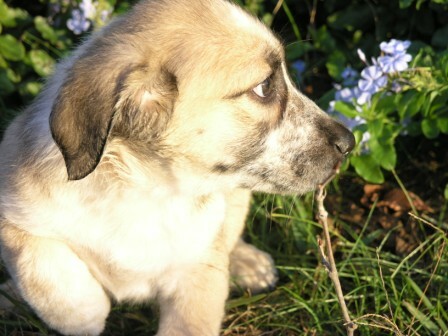 All puppies have been de-wormed, fully vetted, spayed or neutered. All are good with kids, other dogs, and should get used to being with cats quickly. All are fully trained at playing kissy face with or without mistletoe. Holly – Adopted, Female, black and white, schnauzer/basset mix. 13 pounds. Holly is the most social of the pack, and loves to be held and stare into the eyes of her people! Her tail has a special feature, for when she is spoken to, it automatically sets itself to “continuous wag”. 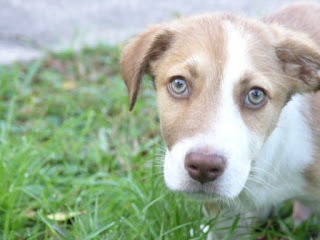 Jolly – Adopted, Female, light brown and tan, green eyes, aussie/basset mix, 14 pounds. Jolly is polite and well-mannered. 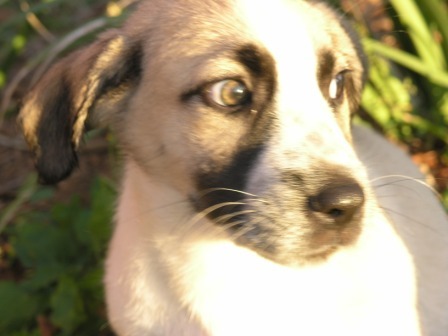 She is very quiet for a puppy, and loves to cuddle and play. Jolly and Kris Kringle are almost identical twins. 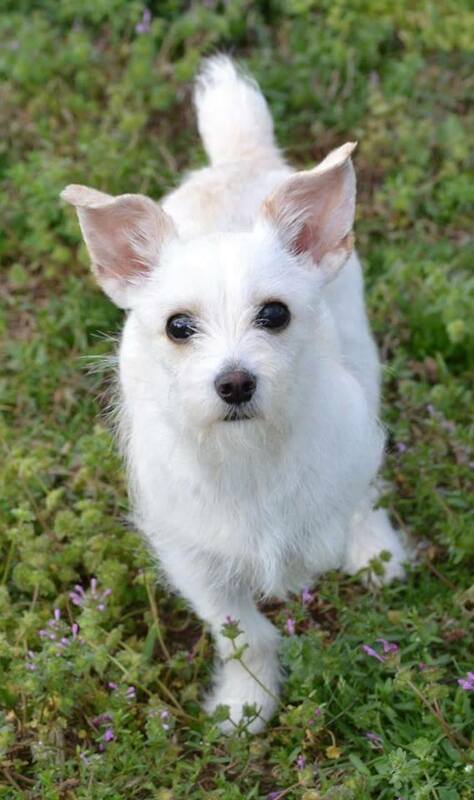 Merry – Adopted, Female, cream & white with black markings, spaniel/basset mix, 11 pounds. 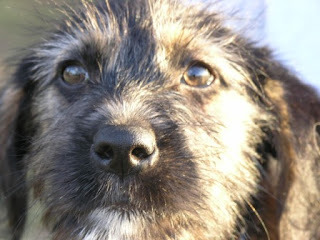 Merry is being fostered with the intent to adopt. Merry is Christmas’ twin. She is a very well-balanced pup. She is patient and waits for her turn to get attention, and will be easy to train. 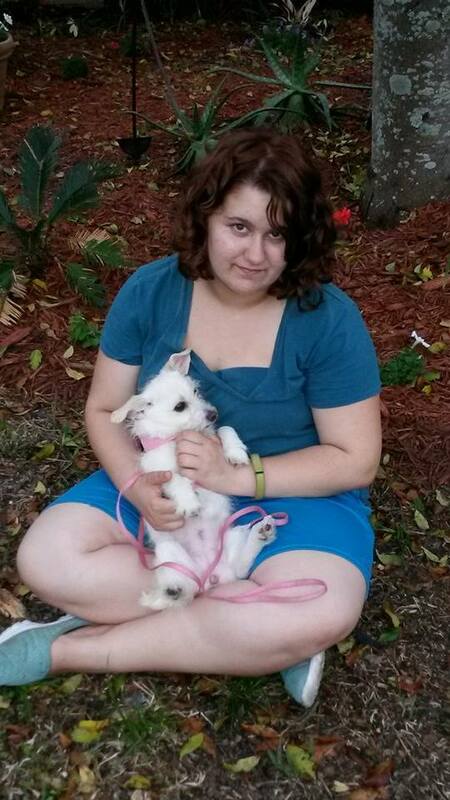 Christmas Adopted, Female, cream & white with black markings, spaniel/basset mix, 12 pounds. Christmas is Merry’s twin! Christmas is a little bit darker in color than Merry, but both have the same temperament, which is calm, and well-balanced. Both are eager to play and will be easy to train. Jack Frost Adopted, Male, white with sable and brown markings and green eyes, Aussie/basset mix, 11 pounds. Jack Frost is very unique. He is the leader of the pack. He loves to play and will probably become quite the athlete of the group. He’s very inquisitive and has been fostered with very large dogs. Jack doesn’t realize that he’s a pup. 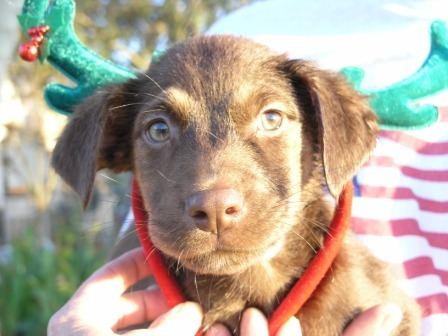 Kris Kringle – Adopted, Male, dark and light brown, aussie/basset mix, 9 pounds. Kris is the runt of the litter. He and Jolly are almost identical twins. Kris is the most shy. When approached, he wants your attention badly, but will not move boldly, instead, he waits and waives his paw asking for your attention. Kris likes to be held and cuddled! My first six months of doing rescue has been incredibly rewarding, and while I have seen some absolutely gorgeous purebreds and darling mixed breeds come through my home and find their way into my heart, rescuing these puppies is my way to give back to all of the unwanted puppies who find themselves in America’s kill shelters, and deserve to have a way out. A special thanks to Value Vet of Deltona who took all six of these puppies in at a moment’s notice to have them vetted. And an extra special thanks to Dr. Susan Wayne for administering early medical care when they were just a few weeks old. Please click on the Comments Icon to read all of the stories from the puppies’ adopted families!